2018 KTM 250 XC - Versus the 250 SX, this model gets electric start, 6th gear, larger fuel tank, 18" rear rim and a kickstand! 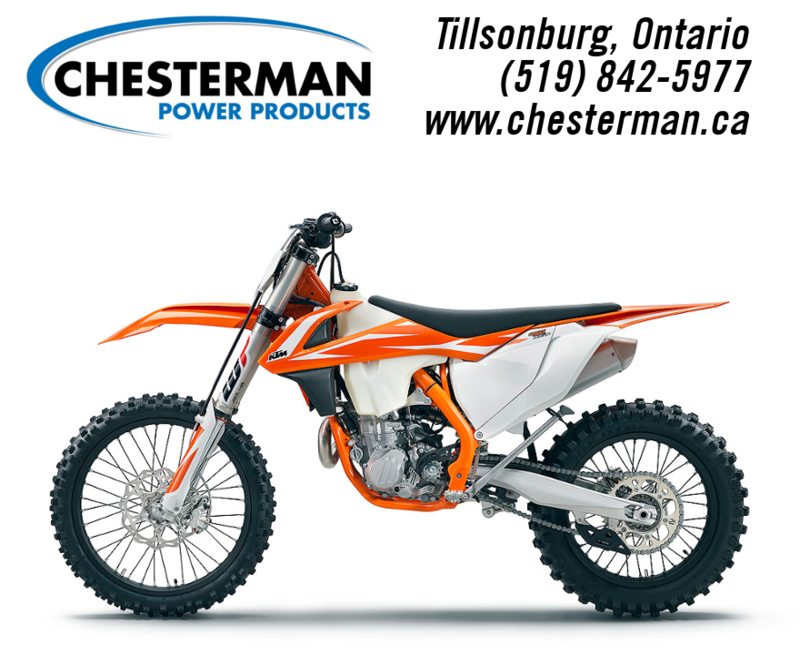 is the most READY TO RACE closed-course off-road 2-stroke 250 ever created.  UPDATED WP AER 48 front fork with a sophisticated air spring design and separate damping for easy adjustment to any track condition, rider weight or skill level. A new setting improves damping.  UPDATED 38mm Mikuni TMX carburetor settings for smoother and more controllable power delivery. The carburetor body has also been turned 7° to reduce fuel overflow.  NEW CDI control unit for improved starting. Ignition curves remain unchanged.  NEW radiator guards provide better airflow in muddy conditions.  The 249 cc engine features a compact shaft arrangement for better mass centralization.  Cylinder with twin-valve controlled power valve for smooth power that can be adjusted within seconds for different track conditions.  Lateral counter balancer reduces engine vibrations for less rider fatigue at the end of the moto.  Hydraulically operated DDS clutch features a damping system for better traction and durability.  Lightweight Chromoly steel frame provides high torsional rigidity with less longitudinal stiffness resulting in excellent handling and energy absorption.  Handlebar clamps feature a separated lower clamp and bridge-type upper clamp for more torsional stiffness.